Piceno was declared to run atLeicesterin the 7 furlong 0-70 handicap for gentleman amateur riders and Kevin Locking was due to ride but due to the bad weather the meeting was abandoned and he was re routed to Catterick the following day instead. Teds Brother ran at Yarmouth in the one mile 0-75 handicap and Jason Hart rode. Breaking well from the stalls Jason tucked Ted’s Brother in fourth place in a group of runners that ran down the centre of the track. Ted’s Brother remained in fourth place for much of the race until around 2 ½ furlongs from home when all the runners came under pressure. Jason manoeuvred Ted’s Brother around a tiring horse and tried to make progress towards the long time leader. At one point inside the final furlong Jason got Ted’s Brother to the leaders quarters but the leader responded and Ted’s Brother stayed on gamely to finish 2nd with a good couple of lengths back to the third horse. It was another gutsy effort from this really consistent horse. He has run 22 times this season; winning 3 times and being placed another 7 times. Anyone wanting lots of action next year should get involved with this horse; there are still a few shares left. Piceno ran in the 7 furlong handicap at Catterick and Tom Eaves rode but the draw wasn’t kind and he was stuck out in stall 13 and was also out of the handicap by three pounds. Breaking well Piceno was front rank but as the leaders begun the turn for home Piceno dropped through the field and swinging into the straight Tom elected to come down the middle of the track as the going was very soft and the runners often head towards the stand side rail. 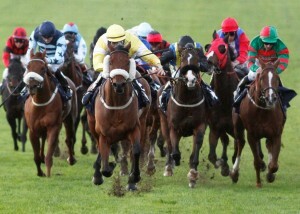 Inside the final two furlongs it was extremely hard work for the horses and the entire field were under pressure. Piceno didn’t look like he was going to finish in the money but he really stuck his head down and kept on battling. A recent course winner flew past the entire field but to his credit Piceno ran on and was doing his best work inside the last 100 yards and finished 2nd. Piceno was quickly turned out again and ran in the 7 furlong handicap at Newmarket on Saturday, Tim Clark rode taking 5 pounds off. Breaking well Piceno got to the front of the field and Tim headed over to the stand side rail. Piceno was travelling really powerfully out in front and was keeping a length in front of the entire field and was unpressured out in front. Three furlongs form home and Tim let Piceno stride on and quickly had the whole field behind him struggling to keep up. Inside the final two furlongs Tim asked for maximum effort from Piceno who duly responded and shot clear of the field by a good three lengths. Inside the final furlong Tim just had to keep Piceno going to record a memorable success at the HQ of flat racing. A tremendous training performance by Scott Dixon and his team to have Piceno spot on again after only a couple of days break and to record Piceno’s second win of the year.